Boismortier’s Six Concerto pour les Flutes-Traver?ieres, Violons, ou Haubois; avec la Baße, Op. 21 were published in early 1728. They constitute the second set of concertos to be composed by a Frenchman, the first being the same composer’s VI Concertos pour 5 Flûtes-Traversieres ou autres Instrumens sans Baße Op. 15, which had appeared just the year before. 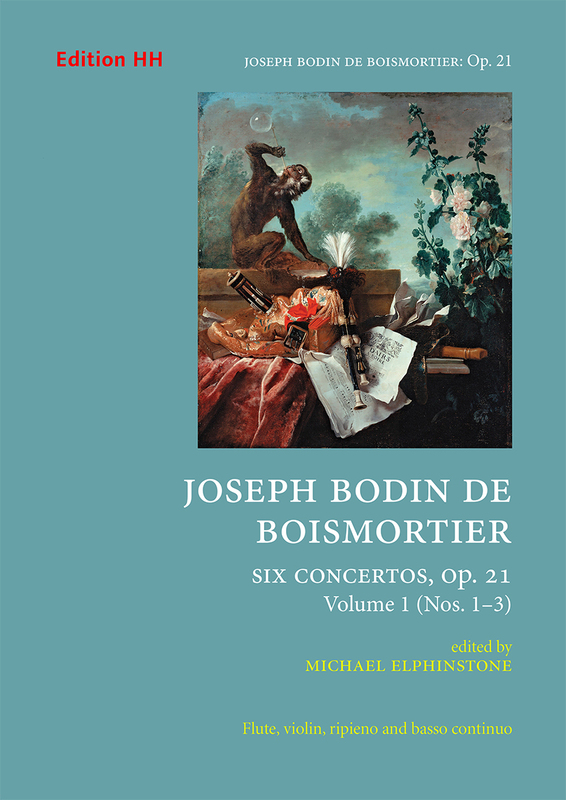 While both sets demonstrate how Boismortier was able to refashion the Italian concerto for a minimum of instrumental resources, the brilliant Op. 21 concertos are much more Italianate in style. This is due not so much to their consistent fast-slow-fast movement scheme and a more extensive use of ritornello-da capo form, as to the character of their thematic material and its subsequent development. Op. 21 was intended for a flute, a violin or second flute, and basso continuo (with a musette or recorder proposed as alternatives to the flute in Concerto No. 3), but the deliberately generic writing and limited range of the treble parts means that the works are playable on a variety of instruments. Boismortier has also provided an ‘ad lib’ ripieno part for a third (unspecified) treble instrument which mainly doubles the flute in the ritornellos; even though this part is optional, it does have independent music in two of the slow movements. Notwithstanding the Op. 21 works bring to mind concertos by Telemann and Vivaldi for two or three solo instruments and continuo, it is questionable as to whether they were directly modelled on foreign ‘chamber concertos’. It is more likely that they are simply the result of Boismortier’s personal experimentation with the concerto genre as he found it. This is certainly implied by the innovative format of Op. 21, which was soon thereafter imitated by other French composers, most notably Michel Corrette with his Opp. 3 and 4.